A black and white photograph of 401 Centre Street South. 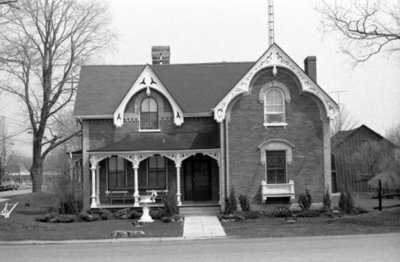 This brick house at the south-east corner of Centre and Gilbert Streets, was built about 1874 by William Dunkley (at 401 Centre Street South). From 1907 until his death in 1914, it was the residence of Donald McKay, Treasurer of Ontario County. It was also the home of his daughter, Emily McKay, who served as Ontario County Treasurer from 1914 until 1947. 401 Centre Street South, April 1976, Brian Winter. Whitby Archives A2013_004_023A.